Interested in the Manfrotto XPRO Ball Head with the Top Lock Arca-Swiss compatible quick release clamp? Read my Manfrotto MHXPRO-BHQ6 XPRO Ball Head review to learn important details about its use and compatibility with Arca-Swiss type plates. Is this the right ball head for you? Honestly, you’re in for a tough decision. If you’re looking for an Arca-Swiss type ball head, you’ll have a big choice ranging from the top of the line Arca-Swiss to a variety of Arca-Swiss “type” or “compatible” brands. Indeed, the market is flooded with options for Arca-Swiss type ball heads. Over the years, Arca-type has emerged as the benchmark in ball head design; thus, many manufacturers follow this standard design. 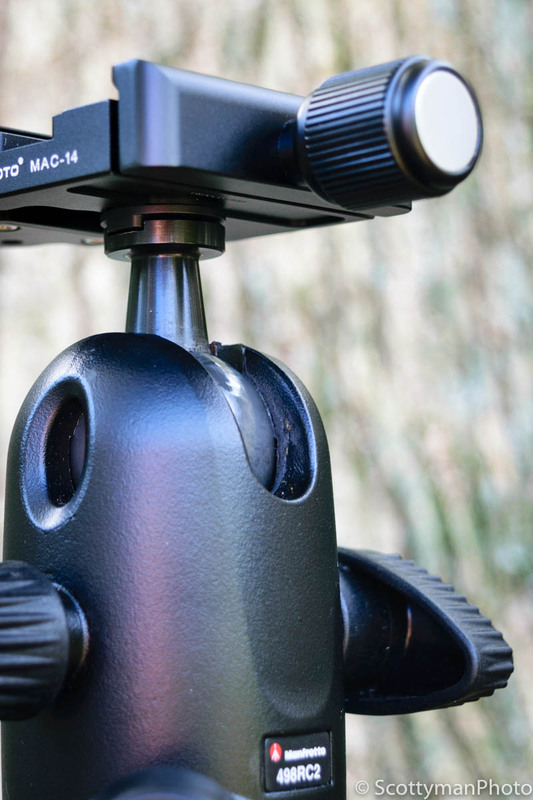 So, what makes this Manfrotto ball head different? Without hesitating, I would say that the Manfrotto XPRO Ball Head offers an excellent compromise between price and top quality. In fact, If you’re looking for a quality Arca-Swiss type ball head, specifically one that provides additional safety features, this ball head might satisfy your needs. Safe working load is 22.05 lbs. Working temperature of 140°F to -40°F. Quick release with three incorporated safety locking features. Independent knobs for controlling ball head friction, panning and locking. Base swivel with 360 rotation. Ball head tilt angle -90°/+40°. Constructed of aluminum and magnesium. Mounting bolt thread size is 3/8″-16 with a 1/4″-20 bushing adapter. 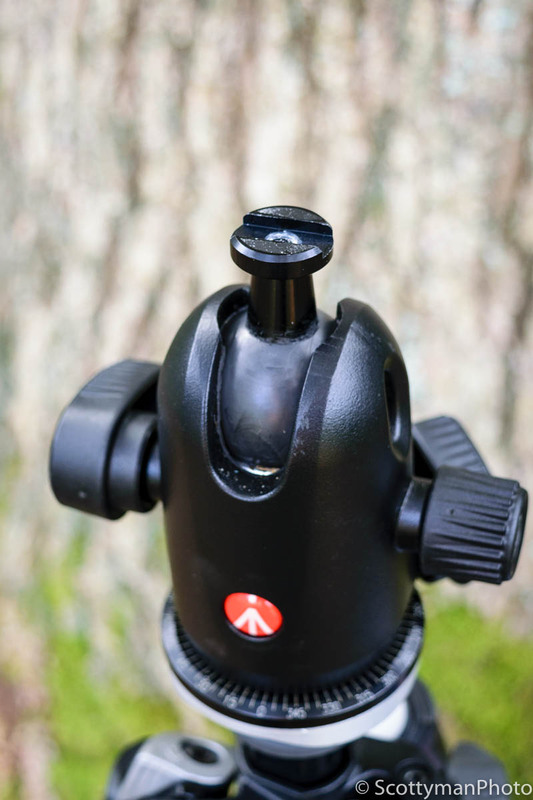 Is the Manfrotto XPRO Ball Head with Top Lock a true Arca-Swiss type? To answer this question, one must first define “Arca-Swiss compatible.” Arca-Swiss is one of many ball head manufacturer. In fact, many so-called Arca-Swiss type clamps simply offer a clamp with a similar design. For additional clarification, read Photography Life’s article on the Arca-Swiss Quick Release System. With this in mind, one can only imagine the tiny variations in the design of the many quick release plates available on the market today. 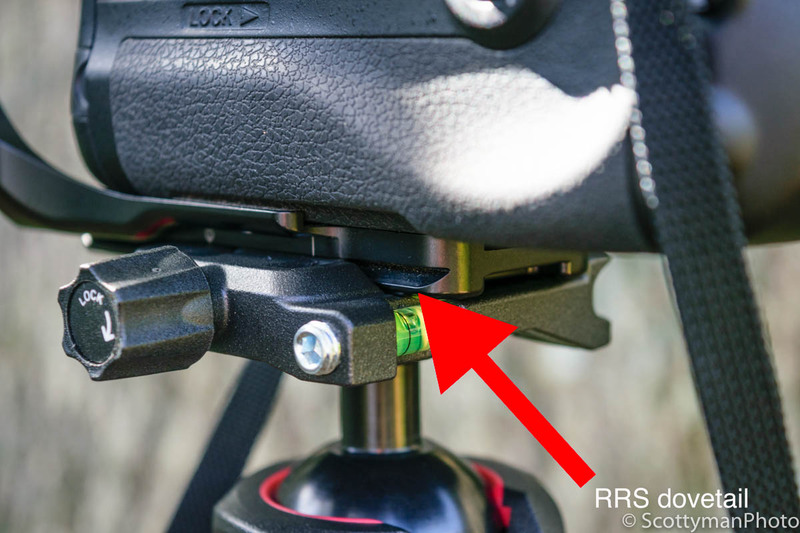 No doubt, you have most likely read an article or two about the incompatibility of “Arca-Swiss type” plates with Manfrotto’s Arca-type quick release clamp. Of course, in light of the wide variety of available Arca style plates on the market, the potential for incompatibility is a genuine concern. All right already! Is the Manfrotto XPRO Ball Head Top Lock compatible with Arca-Swiss type plates? In short, it depends on the plate. Though, from personal experience, I can assure you that the Manfrotto MHXPRO-BHQ6 XPRO Ball Head is 100 percent compatible with Really Right Stuff’s (RRS) dovetail plates. Moreover, not only is it compatible with RRS, they’re a perfect fit. In fact, all RRS dovetail plates follow the RRS Dovetail Standard, click here then select the “learn” tab to view the RSS Dovetail design. To the point, Manfrotto’s Arca-Swiss type clamp performs flawlessly with RRS dovetail plates. Therefore, teaming up with RRS means having a combination of quality, functionality, and versatility. As for other “Arca-Swiss” type plates, if the plates follow a similar pattern to the RRS dovetail, you’re in business. Also, I can confirm that both the Sunwayfoto MAC-14 and ProMediaGear C60 Arca-Swiss type clamps can be retrofitted on the Manfrotto XPRO ball head and both are compatible with RRS plates. I’m still not convinced about Arca-type compatibility, why not just swap out the clamp with an Arca type? Upon first contemplating the purchase of a new ball head and after reading a few blog posts, my main concern turned to compatibility issues with my D800 RRS L bracket. 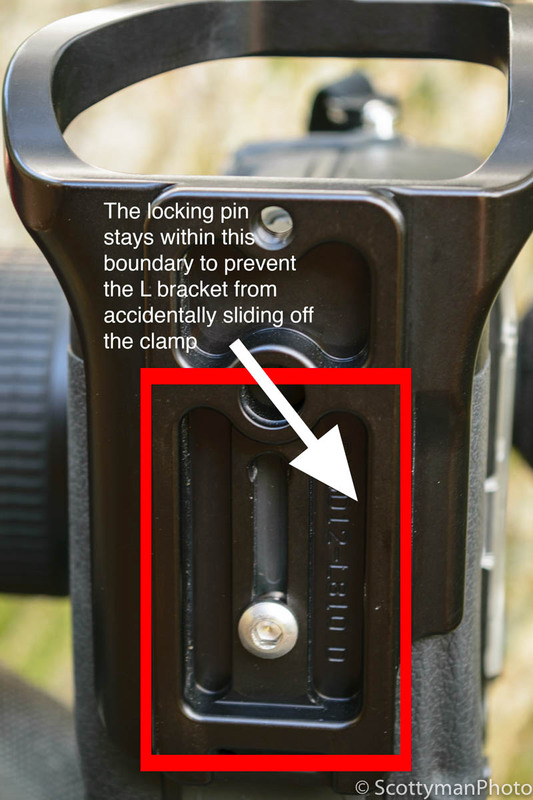 Indeed, when I purchased Manfrotto’s XPRO Ball Head, my original plan involved replacing the Top Lock Quick Release Clamp with the RRS B2-Pro-II Screw Knob Clamp. Actually, I thought combining a top-notch clamp from RRS with the well-known quality and dependability of a Manfrotto ball head would result in the perfect ball head. However, after receiving the package from B&H Photo, to my surprise, Manfrotto’s Top Lock Quick Release Plate not only worked with my L bracket, but it also surpassed all expectations. As a matter of fact, the RRS L bracket meshed perfectly with the quick release clamp’s locking pin; thus, preventing my camera from accidentally sliding out of the clamp. How do I convert Manfrotto’s XPRO Ball Head for use with other clamps? Although I decided to stick with Manfrotto’s quick release clamp, it is possible to retrofit the XPRO Ball Head with other clamps. Nevertheless, if you’re going to make the switch, I recommend using the Desmond DBAD Female to Male Boss Adapter for a perfect fit with Arca-Swiss type clamps. The adapter fits perfectly into the XPRO Ball Head’s slotted notch and flawlessly mates with the Arca-type clamp. Also, the Desmond adapter appears compatible with many Manfrotto models; thus, it makes the ball head compatible with almost any Arca-type clamp. 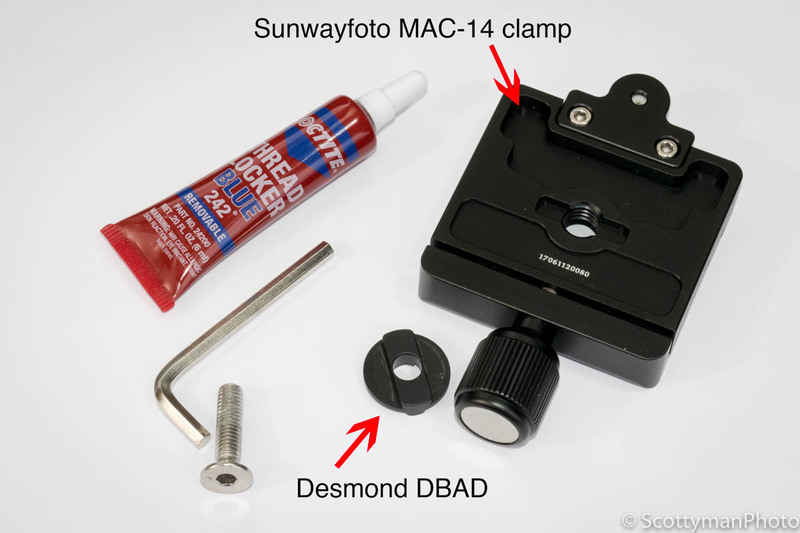 In any event, using a Desmond DBAD, I retrofitted my Manfrotto 498RC2 Ball Head with a Sunwayfoto MAC-14 clamp; the combination works very well together as you can see. Moreover, the Desmond DBAD is top quality and 100 percent metal. Will the ball head drift after locking in place? Drift, or the amount of movement in the ball head after locking, is a crucial consideration in selecting a quality ball head. With a working load of 22 pounds, one might expect zero drift in this ball head. Nevertheless, a tiny amount of drift is present after the ball head is locked into position. However, after you remove your hands and place the initial weight of the camera and lens on the ball head, the ball head remains solid and does not drift over time. Of course, any ball head may drift some, given enough weight. How does the drift compare to other ball heads? Using a Nikon D800 with an attached battery grip and RRS L bracket topped off with a Nikon 24-70 2.8, I experience almost no drift. In truth, when compared to the Arca-Swiss Monoball Z1, I couldn’t tell much of a difference between the two, despite the 130 lb capacity of the Z1. Overall, in my experience with the XPRO, it exhibits little to no drift. Remember, it depends on how much of a load you place on the ball head. Is it true that my camera can slide off an Arca-Swiss type clamp? Fortunately, I have no firsthand experience with such a tragedy. However, I have heard of similar situations. In any case, many Arca-type clamps have installed pins designed to catch on groves or notches in the plate to prevent it from accidentally sliding entirely out of the clamp. Naturally, some movement is desired to allow for adjusting the plate. Unfortunately, in the absence of a safety pin, if one accidentally fails to clamp the plate into position sufficiently, or the clamp loosens, an expensive camera and lens may meet an untimely demise. What’s the chance of forgetting to clamp in my plate fully? Selecting a clamp with added security is something worth considering. Honestly, I never thought it possible for a camera to slide out of a clamp. Although that largely depends on the user. For example, a typical Arca-type system allows one to easily loosen the clamp and slide the plate in and out without fully opening the clamp. In fact, some people may see this as an advantage and timesaver. Nevertheless, in such a case, I can see a situation where someone might forget to clamp down on the plate thoroughly and then, well, you know what happens next. What are the safety features of the Manfrotto MHXPRO-BHQ6 XPRO Ball Head? 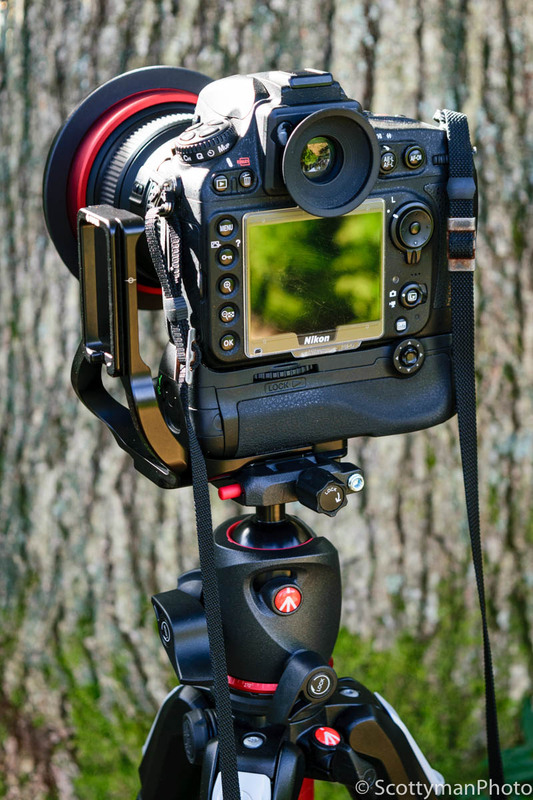 Manfrotto’s Top Lock Quick Release Plate has three significant features worth considering. 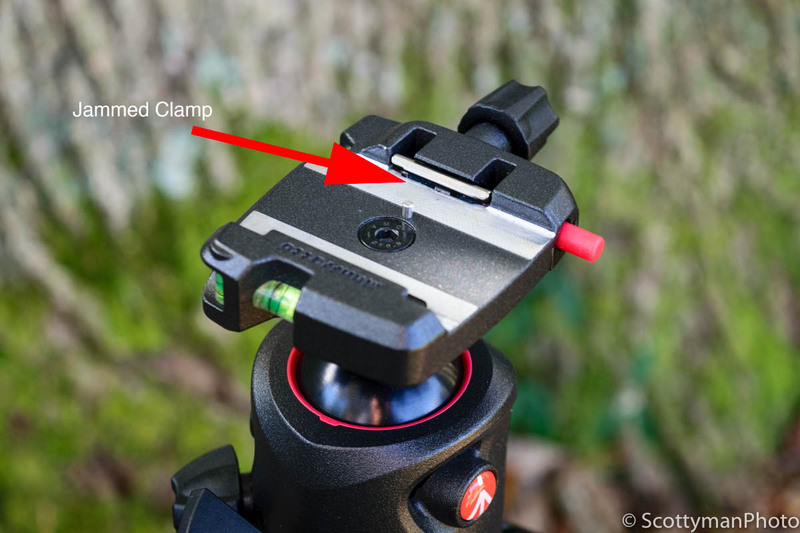 First, the clamp has a spring-loaded locking pin which, when used with the original or a compatible plate, allows the plate to move freely, but prevents the camera from sliding entirely off the clamp. Second, accidental release of the plate is inhibited by the red quick release button. 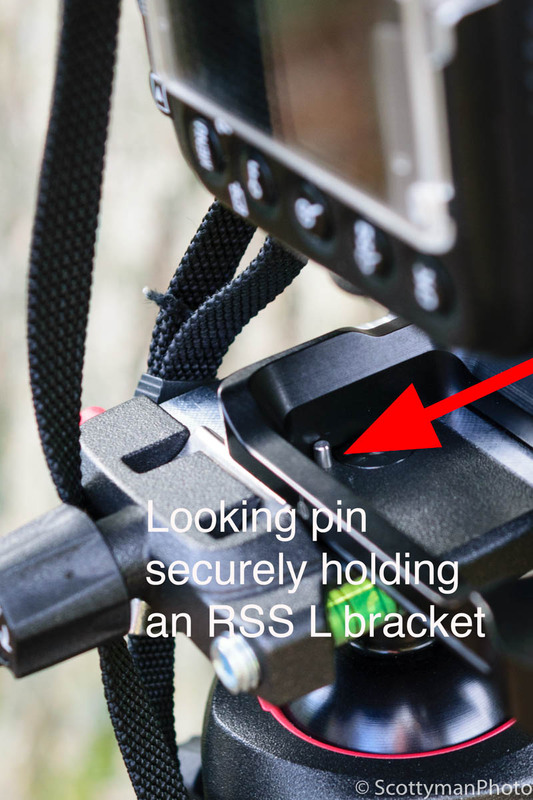 Third, and possibly the most important, when the camera is inserted in the spring-loaded clamp, the plate securely locks in place without the need to tighten the clamp. 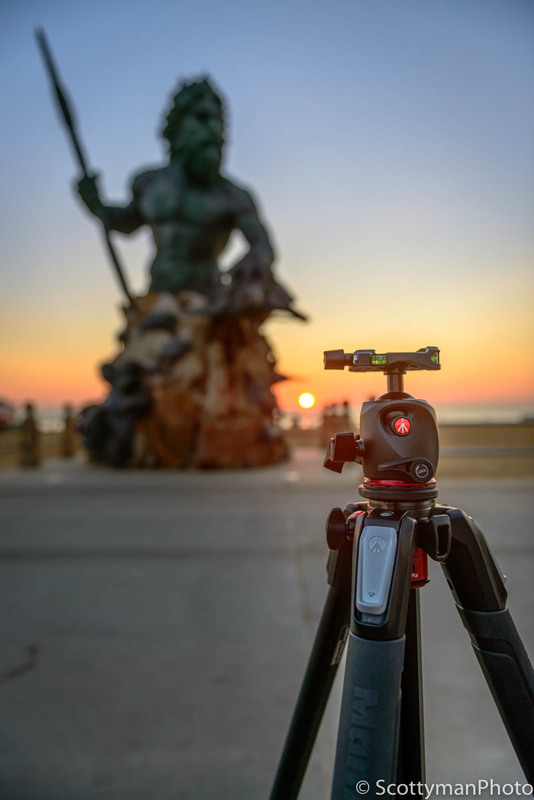 Coupled with easy operation and a three-way locking system, the Manfrotto XPRO Ball Head is a worthy adversary for any top-notch contender. Weighing in at just over 18 oz., the XPRO Ball Head and Top Lock looks huge and sports a magnesium body with a solid feel like that of any top of line ball head. The large Top Lock clamp base measures 3 x 2.5 inches and securely supports my D800 and lens. Although the red quick release button does its job well, it’s constructed of plastic and gives a somewhat unprofessional appearance. In addition to the overall superior quality, the XPRO provides 360-degree rotation with three separate knobs for fine-tuning the ball head’s friction and panning. Frankly, the ability to control the ball head friction is comforting If you’re concerned about damage to your lens from an accidental collision with the tripod. How does the Manfrotto XPRO Ball Head with Top Lock compare with other quick release type ball heads? Compared to the several turns required by a traditional Arca-type screw knob, the XPRO Top Lock needs less than one turn to release the camera from the clamp; although, the operator must push the quick release button. At first, the thought of an additional step was not my idea of the perfect ball head. However, after experiencing the safety features firsthand, I find the XPRO’s Top Lock quick release system superior to any clamp I’ve ever used. Indeed, I also considered replacing Manfrotto’s quick release clamp with an RRS lever-release clamp, but I reconsidered out of fear of an accidental release. A lever release clamp is fine, but in addition to added security, I prefer the ability to tighten the clamp to my satisfaction. Are you saying this is the perfect ball head? To my surprise, the Top Lock clamp on the Manfrotto XPRO Ball Head overcame all my concerns while offering additional security features. But unfortunately, the perfect ball head is yet to be discovered. Truly, the quick release clamp does have a few problems. For example, when placing the camera in the clamp, if the screw knob is not adequately loosened before insertion, the spring-loaded clamp may catch and stick open. Nevertheless, a quick tap on the clamp pops out the wedge and you’re back in business. Although this has only happened on a couple of occasions, It’s not the kind of quality I expect from Manfrotto. Still, it’s not enough of a problem for me to return it! Honestly, I selected the Manfrotto XPRO Ball Head with Top Lock over the legendary Arac-Swiss Z1 for two reasons. 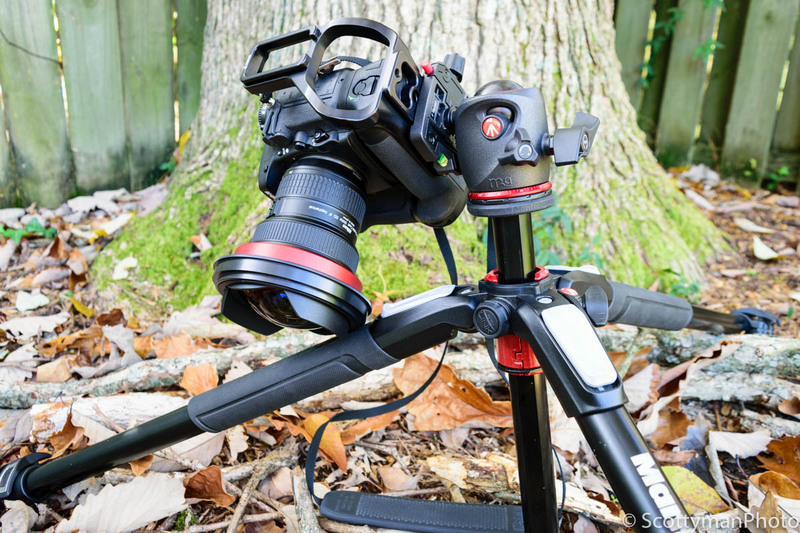 One, Manfrotto’s price was unbeatable, especially when you factor in the quality. Two, the safety features of the Top Lock system settled any internal conflict I was experiencing. The Manfrotto MHXPRO-BHQ6 XPRO Ball Head is well worth the price and, in my humble opinion, is one of the best ball heads available on the market. Compatible with Arca-Swiss type plates. Superior ball head friction control and smooth operation. Fast and easy camera insertion and release. Quick release plate occasionally jams. Red quick release button has a cheap look. After using Manfrotto’s XPRO with Top Lock and comparing it to other ball heads, I think it holds up to even the best of the best. Although this ball head may seem inexpensive compared to others, don’t let the price fool you. The XPRO is a top quality ball head at a great value. Manfrotto could easily add a hundred dollars to the price tag, and I wouldn’t hesitate to buy it today. With that said, if you’re still on the fence, you may just have to see it for yourself! I highly recommend picking one up immediately. I purchased this ball head with the Arca Swiss compatible mount largely based on your review and am very happy with it. I had bought it originally to use on a second set of legs for largely indoor use, but have since moved it to my primary tripod and it is working wonderfully. Steve, I’m delighted to hear my review helped you with your purchase. The XPRO is a fantastic ball head!